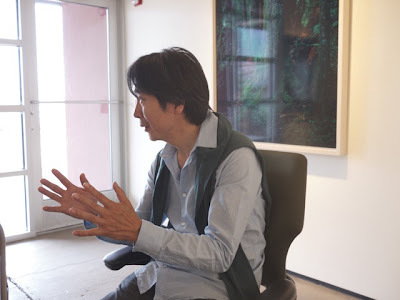 The conclusion of photo-eye's interview with Yoshihiko Ueda. Rixon Reed, Melanie McWhorter and Antone Dolezal sat down with Ueda and translator Koichiro Okada at TAI Gallery in Santa Fe NM. Click here to read Part 1. RR: This is the first time I’ve actually seen your photographs, I was curious as to whether or not the book translated well. I think the book does a beautiful job of reproducing the work – the color, the richness, the contrast, it’s very similar to the actual photographs. My question has to do with when you made the first photograph, and you made a print – do you shoot transparency or negative? RR: So when you first saw that transparency, did it have the same color pallet as we now have in the prints? The same colors, the same saturation, or in making the prints, do you tweak the color some to produce something that is not actual represented in the transparency? YU: My printing process is how to recreate the exact same tonality appearing on the transparency. RR: So if I held up the transparency it would look similar to the print. YU: Yes. Very much so. The original print from the transparency was a dye transfer. RR: But these aren’t dye transfers [pointing]. YU: Yeah, the original. These are C-prints. RR: Wow. So is the entire body of work also available as dye transfer prints? YU: Yes. I made one set. I had an exhibition in Japan of this work and for that exhibition I made dye transfer prints. I only made one set of this series in dye transfer. Because the very first print was dye transfer, which I was very satisfied with, when I decided to make the C-prints I had a little fear, “Can I come close to this?” My goal was to make a print as close as I could to the first one, however, when I placed the two next to each other, I feel that the C-print comes closer in expressing my original sensation, the original color of what I saw and experienced in Quinault. So I’m more happy with the C-prints. RR: How interesting. Now, these prints are only available in this size, is that correct? YU: Each image has two sizes available. The smaller size was the original size of the dye transfer. RR: When was the original exhibition of this work? YU: The year following taking these photos… I believe 1992. RR: So shortly before the publication of the book. And is this the first exhibit of this work in this country? In the United States? MM: I know. The other exhibit that was the first in Europe, that was recently too. RR: Michael Hoppen Gallery, that’s your first exhibit of this work in Europe? RR: Wow. Why do you think it’s taken so long to gain recognition? The work is so beautiful and I would think that shortly after the publication of the book there would have been exhibits or interest in the work. Perhaps it’s because you were not known in the country or in Europe and it’s taken this long to finally become better known? YU: I don’t know the reason why it took so many years for me to have these over seas shows. I some how feel that it’s part of special domestic reasons in the Japanese photo world. If a Western photo artist does an exhibition in one city in Europe, if the exhibition is well received it will probably go to the next place much more easily. But somehow in Japan the information does travel that fast outside of Japan. I also didn’t make an effort, which might be part of the reason. Even with this long gap between my first show and the recent three shows, it was also interesting that I got approached by two men, Mr. Robert Coffland and Mr. Hoppen almost at the same time from the United States and Europe. I thought that was strange. AD: Had both seen the prints on the wall in Japan when the approached you? 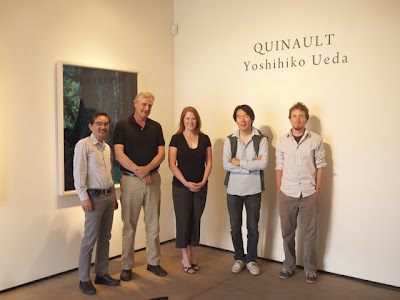 YU: I had heard that Mr. Hoppen had had my Quinault book and had been thinking about it for a while and saw a Quinault photo at a friend’s home and that’s when he got really interested in it. AD: I think that it’s really interesting that he viewed the work from the book. When I view the prints I get encapsulated with each print individually and each portrait of the tree -- I can completely get sucked into the image. And when I look at the book I have much more of an understanding of your experience as a whole because it flows very well as a series in the book. With the images I have a different experience. How do you feel about the way the work is presented in the book compared to how it’s presented in prints or an exhibition? YU: I agree with you. 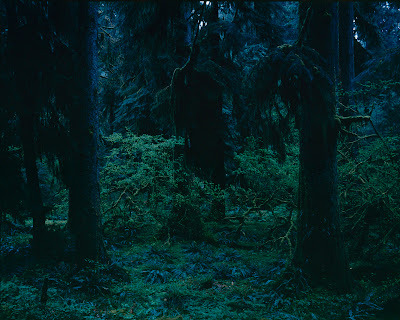 When I made the Quinault book it was my intention to have the viewer share the same experience that I had in the rainforest. With a show like this there are spacial limitations so I cannot use all the photos and I have to select the work. I want the viewers to be face to face with each one, to feel the energy of each one. MM: It seems like this is the beginning and this is the end [pointing]– are they laid out chronologically in the exhibit or in the book so that it somewhat mimics what you experienced? YU: When I was selecting which work should go on which wall, I wasn’t really thinking of it in a chronological way, however, it just happened that way. This was placed here at the beginning [pointing] and this ended the exhibition [pointing]. Even though I was not thinking of it, I feel like that was the way it should have been. There was some kind of special energy that made the installation happen that way. RR: So just to be clear, you were here for the hanging of the show and you helped order the show? YU: Yes, it was my decision. RR: That you very much, that was delightful! 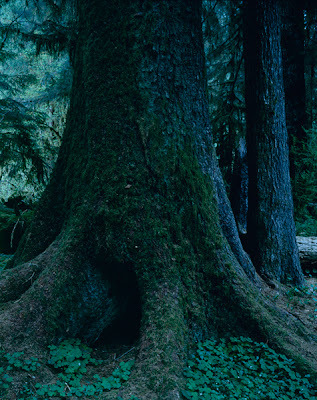 See information, description, and images from the Quinault book here.